The MPF-1 (MicroProFessor 1) was a computer system specifically designed by Multitech (now known as Acer!) as a learning tool for use in the teaching of microprocessor, microelectronics, and control technology. 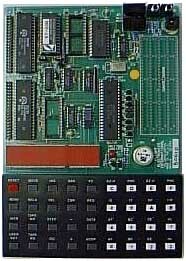 In the 80's it was sold as an Z80 CPU learning and initiation system, and believe it or not, it is still in production and sold by www.flite.co.uk !! at the time this article is written. The capacities of the system were quite poor. The standard model could be programmed only in machine code through the small hexadecimal keyboard. When sold in it's original package it had the particularity to look like a book when closed. There was an EPROM socket which can be compared to a cartridge slot. A mini-Basic EPROM and some other utilities and languages were available as options. There are in fact two models : MPF-1 (later called MPF-1A) and MPF-1B. The MPF-1(A) is machine code programmed only whereas the MPF-1B offers a really crude version of BASIC (one button = 1 command, as per the early TRS-80) in addition to the machine code capabilities. After teaching myself 6510 machine code on the C64 (well Commodore Basic was useless) aged 15, I 'formally' learnt machine code programming at college (aged 16) on one of these things when I was aged 16~18 during my Ordinary National Diploma in Electronics Engineering. It was an excellent teaching tool though. No distractions in the way of fancy GUIs and you had to concentrate on the job in hand. Everyone should be made to learn machine code programming first before high level languages. It makes you break problems down into the lowest level possible. It certainly makes you more concious that you are writing sloppy code in hll's such as C.
The picture you have is not of this board as it was in 1979-84. I suspect that this is of the modern version which was clearly re-designed at what point in time I do not know. Although, the specification does appear to be identical; hopefully they have replaced the power regulator, which on the originals heated up to 70�C and you were advised not to touch it! see more Multitech MPF-1 A/B Ebay auctions !